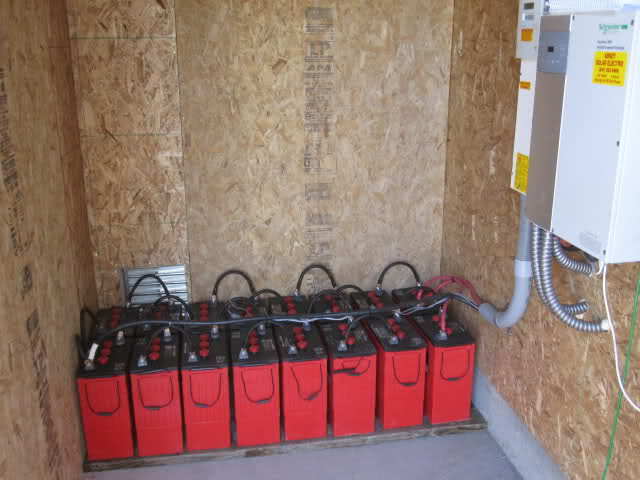 The primary type of energy storage device used in most modern off-grid solar power systems is the deep cycle battery. A deep cycle battery is designed to be deeply discharged over a long period unlike a car starter battery which is more suited to delivering short bursts of power such as that needed to crank over a cars starter motor. A deep cycle battery has three essential parts: the anode (+), the cathode (-), and the electrolyte. A chemical reaction occurs inside the battery causing the build-up of electrons in the anode, the electrons in the cathode are reduced by the same electrochemical reaction creating a difference between the anode and the cathode. Electrons try to rearrange themselves and recreate the balance that has been lost attempting to travel towards the cathode, the electrolyte's role is to prevent this from happening. There are many different types of deep cycle batteries including flooded batteries, gel batteries and AGM batteries (Absorbed Glass Mat). Each type has a different construction. Flooded batteries are the most common type and are the same as the lead-acid batteries in most cars. Gel batteries are filled with a particular kind of gel, AGM batteries consist of acid suspended in a glass mat separator. A battery is rated in two aspects of its capability, volts and amps. Amp hours (Ah) is the available capacity inside the battery's chemical energy that can be converted into electrical power. This also can refer to the amount of energy a battery can store and the discharge rate or time it takes to discharge the battery before it needs recharging. Battery capacity is reduced if a battery is discharged over a shorter time, for example, one hour, the amp hour capacity will be reduced by 50% and so will the number of cycles. Where a battery is discharged over some hours at a constant rate, this rating is called the "C" rating. If a battery is rated at C20, it will deliver its amp-hour capacity over 20 hours. 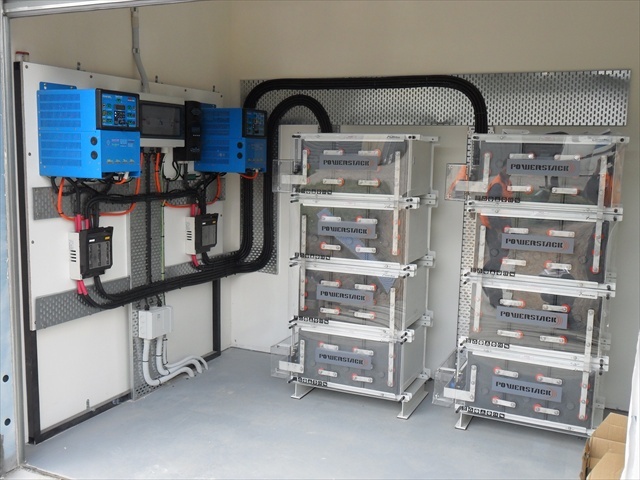 Deep cycle batteries used in large off-grid solar power systems are usually rated at C100 meaning they will discharge over a 100 hour period, these batteries can last up to 15+ years if looked after. Choosing a deep cycle battery for your off-grid solar system may not be a simple task as not all batteries are created equal, and as installing your system should be a long-term investment you will want to make the right decision. A good starting point is to take a look at the battery cycle rating. This is the number of times a battery can be discharged and recharged. The best test for this is the IEC 896-2, based on a 100% discharge, even though its not recommended to fully discharge a battery this test gives a good even starting point for cycle ratings making comparing two battery brands simpler and more honest. Absorbent glass mat (AGM) is a type of lead acid deep cycle battery where the electrolyte is absorbed into a mat made from fibreglass, the plates in an AGM battery can be flat or wound in a spiral formation. The resistance inside an AGM is low and they can handle higher temperatures and will discharge slower than most. AGM batteries have a built-in valve that opens when the battery is recharged at high voltage, and this allows some of the battery material to escape decreasing the overall battery capacity. There is a gas diffuser that allows the hydrogen to escape safely, they are also maintenance free and can be mounted in any position, unlike lead-acid batteries that need to be kept upright. AGM batteries are sealed and easy to move around safely. No maintenance is required such as fluid level monitoring. They can be mounted almost anywhere safely. The low internal resistance means they can be fully charged at a lower voltage and will take a more substantial charge current taking about 3-4 hours to get a nearly full charge from an alternator. It is possible to get a much deeper discharge from AGM batteries with less risk of damage. AGM batteries will self-discharge at around 3% every month if not used, even after 12 months laying idle they can be put back into service without any damage or loss of working ability. AGM batteries are reliable and robust power units. The phrase "sealed lead acid battery" can be a bit misleading as a sealed battery would be dangerous due to pressure risks when the battery is overcharged. In these batteries, there is always some a safety valve to prevent a hydrogen or gas pressure explosion. The oldest kind of rechargeable deep cycle battery in use today is the flooded lead-acid battery or wet cell battery. These types of batteries have a liquid inside and are not sealed, so they need to be stored and used in an upright position to prevent fluid from escaping. They also produce hydrogen gas, so the need for proper ventilation is essential for safety. A flooded lead-acid battery will require regular maintenance checks specifically a fluid level check to make sure the lead is covered, and they can be topped up with distilled water to maintain the correct level. Gel batteries or Gel Cells are valve regulated deep cycle lead acid batteries with a gel type substance acting as the electrolyte, unlike flooded lead-acid batteries they can be stored and used in any position. Gel batteries are maintenance free and can take high temperatures and impacts without damage that would otherwise damage flooded lead-acid types. A lithium-ion is a member of a family of rechargeable battery types in which lithium ions move from the negative electrode to the positive electrode during discharge and back when charging. Li-ion batteries are the latest and greatest home energy storage devices there are at the moment, and when the price comes down will bring about the new revolution in home energy storage. There is a big buzz about this type of battery in the media with the big announcement from the Tesla company about their Power Wall home energy storage device. 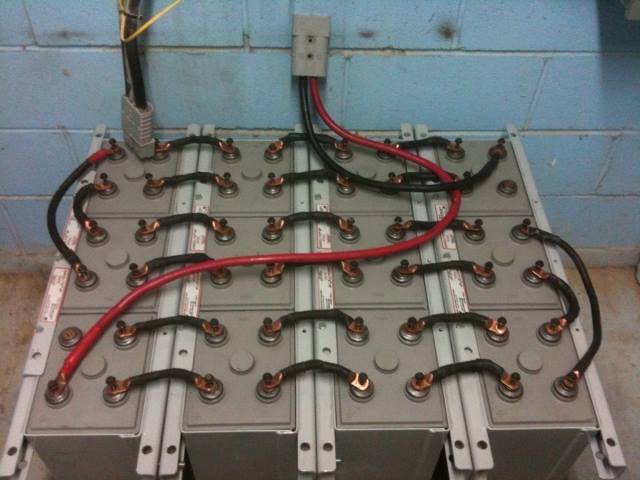 Off-grid deep cycle batteries are designed to last a long time and have much thicker lead plates than average. It's not good practice to discharge a deep cycle battery below 20% of its full charge due to internal resistance creating heat when recharged. This is where a good quality charge controller with a low voltage cut off system can help prevent too much discharge resulting in damage and shorter battery life. Batteries can explode if a malfunction occurs or by misuse by humans such as trying to recharge a non-rechargeable battery or causing a short circuit. Explosions are likely to happen when a short circuit makes a large electrical current, the risk of an explosion is also due to the presence of hydrogen gas exploding after being ignited by a spark or other ignition source or merely a build-up of gas pressure due to a faulty or block release valve.